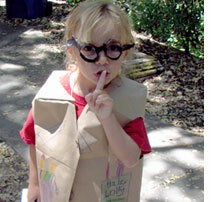 The San Jose Blog: Montalvo Winter Camps: Spies & Clowns! Montalvo Winter Camps: Spies & Clowns! When my cousin and I were really little we liked to play a game we simply called "Spy." Every kid does this so I'm sure you can relate. We snooped around and "spied" on our family. We'd hide in painfully obvious locations, whisper about the person we were spying on and then giggle just loud enough to completely give away our awesome hiding spots. Maybe my cousin and I would have been better spies if we had been sent to Spy Camp, but that option didn't exist for us. It is, however, available for your kid! Montalvo Arts Center, thanks to their Youth Scholarship Program, offers fun camps for kids this coming February. "Taught by top arts instructors from around the Bay Area, these camp sessions encourage the creative process and give campers an opportunity to engage their bodies and their minds in challenging, thought-provoking fun, all the while making new friends." Master the finer points of espionage and challenge your mind at this adventure camp! After exploring Montalvo's grounds and designing a 3D map of the property, students will learn about secret "languages," riddles, and other methods of encryption to create an alphabet that only their special team knows. 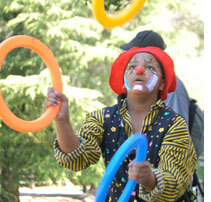 In addition to Spy Camp, Montalvo is also offering Circus Arts Camp! Now -- adult clowns I can do without, honestly. But cute little kid clowns are awesome! Come join the circus! In a fun, safe, and challenging environment, students will dabble in the circus arts of juggling, tumbling, pyramid building, rolling globe, and more. Circus Arts train both the body and the mind, and help build self-confidence, discipline, coordination, and a great sense of humor. These classes are filling up fast, so if you are out buying gifts for the holidays or upcoming birthdays, register now! Registration price per class is $175 (members: $160), not including a $20 materials fee or $20 non-refundable registration fee. Montalvo coordinates a scholarship program for students who would not otherwise be able to attend. For more information on how to apply, please visit www.montalvoarts.org/programs/scholarships.